Барааны дугаар Байхгүй. Categories: CAMBRIDGE, English for Academic Purposes. 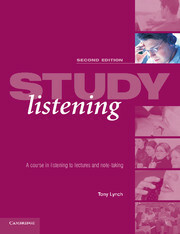 A course for intermediate and advanced level students focusing on listening to lectures and note-taking. Study Listening is for intermediate and advanced level students who are planning to study at a university or college where English is the language of instruction, or who need to attend international conferences where English is used. The course focuses on listening to lectures and note-taking. The Second Edition has been comprehensively revised and restructured and now includes eight brand new lectures on academic topics with speakers from six different countries; more focus on six macro-strategies for listening: predicting, monitoring, responding, clarifying, inferencing, evaluating; more post-listening tasks to deal with comprehension problems.